In a bold and unexpected move PUBG Corporation has launched a new website and campaign addressing many of the most popular and serious complaints about PlayerUnknown’s Battlegrounds. 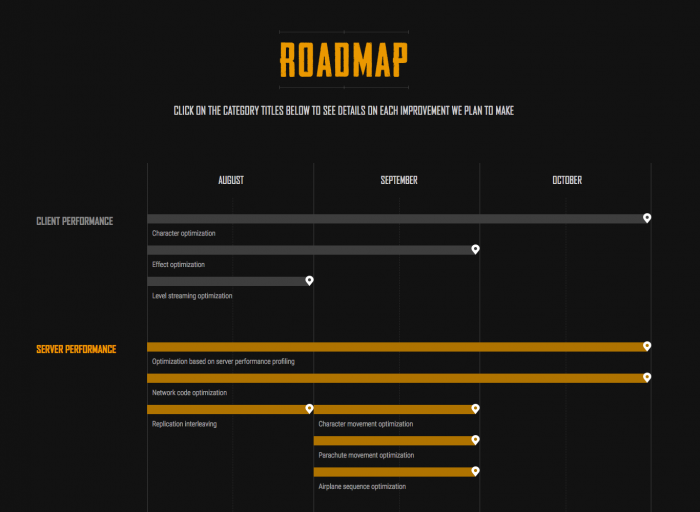 Said road map includes a 3 month projection for improvements in the areas of client performance (character/effect/level streaming optimization), server performance (server profile optimization/network code/etc. ), matchmaking, bug fixes/quality of life issues, and of course, the ten ton elephant in the room, anti-cheat measures, which will include “implementing a combined anti-cheat solution,” a report result notification system, and even going so far as to ensure legal action against developers of cheat applications. Whether or not these fixes come too late in the game remains to be seen, but with the active player count of PUBG on the rise again recently, it certainly seems like the changes are better done late than never at this point.